Welcome to day 2 of the Mother of all Chocolate recipes. This week my posts are showcasing the versatility of this beautiful chocolate sauce. It stores well in the fridge and reheats beautifully, giving you two or three weeks to find other uses for it. If you have leftover hot fudge sauce you can store it for a few days and then make this, or you can make this and have leftovers for hot fudge sauce. For this cake, Amaretto is my preference for the alcohol flavouring the chocolate. 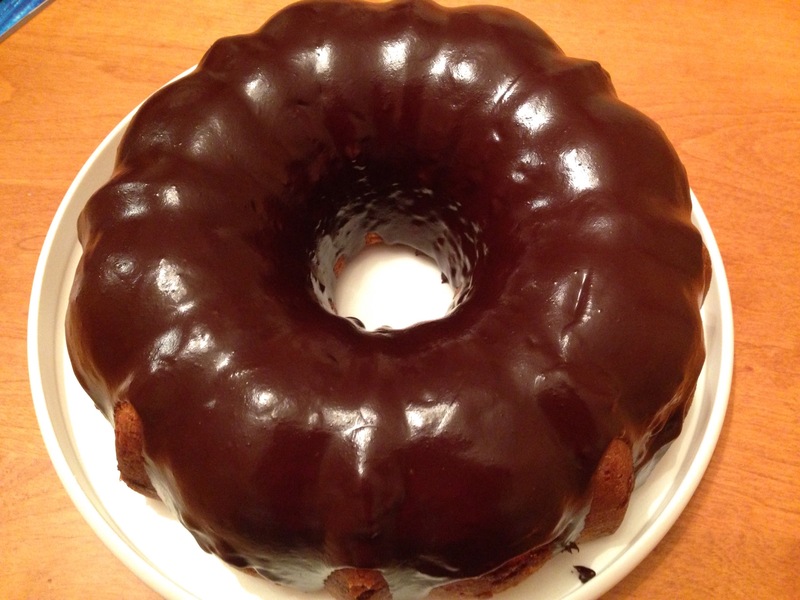 This almond bundt is my favourite cake to make for a crowd. It is delicious and substantial, so can be cut in thinner slices to serve more people. The chocolate topping caps it off beautifully. 1. Preheat oven to 350 degrees F. Grease and flour a 10 inch Bundt pan. Mix together the flour, baking powder, salt and ground almonds. Set aside. 2. In a large bowl, cream together the butter and 2 cups sugar until light and fluffy. Beat in the eggs one at a time, then stir in the 1 Tbsp. almond extract. Beat in the flour mixture alternately with 1 cup milk, mixing just until incorporated. Pour half the batter into prepared pan. add a layer of jam, trying to keep the jam away from the edges of the pan. Cover the jam layer with the last half of the cake batter, making sure batter meets batter instead of jam around the edges so it holds together and the jam doesn’t burn to the sides of the pan. 3. Bake in the preheated oven for 60 to 70 minutes, or until a toothpick inserted into the center of the cake comes out clean. Cool for 10 minutes and remove from pan by inverting it onto a wire rack. Cool cake completely. Pour room temperature chocolate (or slightly warmer) over top. You want it pourable, but not as thin as when it is hot. I don’t have a photo of the inside of the cake as this one was destined for a pot luck where my husband works, and alas, there were no leftovers. It does look quite nice though, and tastes even better. It does taste good 😊.